You will find that the National Lottery is the supplier of the most played lotteries in the UK, there are several other lotteries which are licensed and recognised in the UK and they include ones such as the Postcode Lottery and the Health Lottery, and those are held on different days of the week or month. However, the National Lottery is the one most players choose to play and there are in fact several different draws you can enter which are run by the National Lottery. All profits made are donated to a range of different charities and there have been billions of pounds raised over the years. Here are the different National Lottery draws that are offered and alongside each of them you will find the days that these lotteries are held and how you can play in each of them. Lotto – The lotto draws are held every Wednesday and very Saturday and when you take part in these lotteries you will have to pay £2 per ticket you purchase, that will then see you being able to pick six numbers from one to forty nine in number and when you match at least three of the numbers you have chosen with the six drawn out of the machine you will win a cash prize. Thunderball – The Thunderball lottery draws are held three days a week those being on a Wednesday a Friday and also on a Saturday. The ticket price is £1 on this draw and there are thirty nine numbers in the first machine and 14 numbers in the second you have to pick five main numbers and a Thunderball number when you enter this draw. Lotto Hot Picks – This draw is held on both a Wednesday and also on a Saturday and you have to pick just five numbers from one to forty nine on each ticket you purchase. If you manage to match at least three numbers with those that have been drawn out of the lottery machine then you will win £450, however the more numbers that you do manage to match the larger that jackpot payout can and will become. 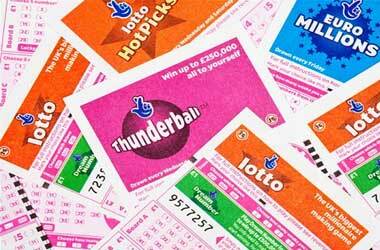 To buy lottery tickets in the UK you have to be at least the age of 16. You should not have too many questions regarding entering a UK lottery draw for they are quite self explanatory however below are a few of the most commonly asked questions which may be of inertest to you and the answers to those questions will be found below too! Which casino site has lottery based games on offer? If you are looking for a range of lottery based and themed casino games and a site which is fully licensed and regulated in the UK then we can recommend the Titan Bet Casino, this is a casino that uses the Playtech gaming platform and you will have access to lots of different games when play there. To learn more about this first class casino site please take a look at our review of Titan Bet Casino as we have a high valued welcome bonus to introduce to you which will allow you to boost the value of your initial deposit. One of the main benefits that all UK based gamblers have is that they are never going to be charged any type of tax on nay winnings they achieve when gambling. This is also very true for all lottery based winnings, and as such if you do win any amount when playing a lottery in the UK then the entire amount of cash you won, no matter how large is yours to keep tax free! In fact the UL laws and regulations surrounding lotteries is that all winning players have to be paid their winning sin one single payment, and as such you will not be drip fed your winning over weeks, months or even years which is often the case with lotteries held in different countries! Where can I buy UK lottery tickets? You are going to be able to buy lottery tickets either online at the official National Lottery website or you can buy then in cash from any designated retail outlet. Please do not buy lottery tickets from any other source as there have been the odd website set up to trick player into buying tickets at those sites and the sites are fake sites and no lottery tickets will ever come your way if you do make a purchase from those fraudulent websites! If you wish to learn more about playing at UK licensed venues then we have a wide range of different resources that will enable you to get a much better understanding of those topics. Keep on reading for details of our additional articles and news stories that you will find helpful. Land based UK Casinos – If you are thinking of visiting in person a land based UK casino site then we have a very informative guide and resource that will explain how you can become a member of such a venue and what is on offer at all land based casinos in the UK. UK Bingo Clubs – You will find there are lots of bingo clubs in the UK at which you can play bingo in a social setting morning, noon and night! If you have an interest in doing so then take a look over this land based bingo guide for more details. Racecourses in the UK – Betting on the horses is something a lot of people do in the UK however many of those people will occasionally visit a racecourse in the UK and if you are thinking of doing so then this informative guide will be of interest to you. UK Gambling Laws and Regulation – If you wish to learn how all UK based and licensed gaming venues and sites are regulated then take a look over our guide to the UK Gambling Commission for it is that government agency that is tasked with doing so.